The sailplan, with the mast set well forward, clearly favors the mainsail at the expense of the genoa. You'll love the "sunroof" for adjusting the sails, and the overhang of the coachroof and the vertical windows which help reduce the "greenhouse effect". Designed down to the smallest details, this Nautitech is all about efficiency and seamanship. No gadgets, nor fancy marketing: this truly is a catamaran designed to lastƒ which makes it a second hand boat to look out for. Nautitech has not been part of Dufour since 2002. If the first boats in NautitechÍs second generation - including the 40 and the 47 which were launched by the builder - were directly descended from the previous models, the 44 launched in 2006 was an original designƒ The Mortain/Mavrikios design team worked for 18 months on the project. Finally, putting aside the famous U-shaped galley as seen on the Nautitech 435, they made lots of changes, starting with the deck layout being completely redesigned, with an overhanging coachroof and more-upright hatches. The comfort level of the accommodation also improved. The choice of rather fine hulls was maintained and itÍs just as well: thanks to them, the 44 shows great potential under sail, despite a less favorable sail area to weight ratio - 10.33m_/t as opposed to 12 for the 435. The emphasis was put on the conviviality of the nacelle, which is flush-decked with the cockpit. However, compared to current standards the load capability is significantly lower. The career of the 44 continued until 2014 under the guise of the 441 and 442: the former having a single helm station, as opposed to two for the latter. Both had a more flattering finish and larger hatches in the hulls, and also had the option of a square-topped mainsail. A quick boat with keels which draw 1.20 m, the Nautitech 44 goes rather well upwind. A design classicƒ which is ageing well! The coachroof, even if it is more prominent than that on the 395, is still understated and integrates remarkably well into the overall lines - the fineness of the hard-top bimini, a Nautitech feature since 2003, helps a lot. A nice piece of design, with reverse sheer, which if not revolutionary is still up to date ten years after it was launched. 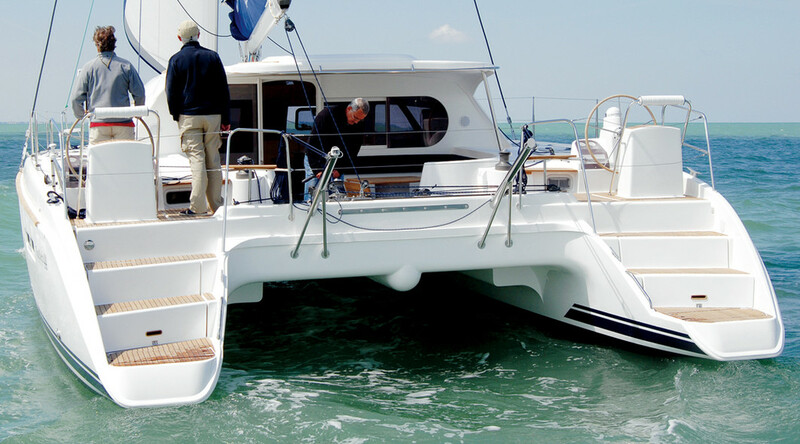 The builder and the naval architects clearly favored sea-keeping qualities, with the freeboard being kept reasonable, a lower waterline beam than the majority of current comfort-type catamarans and above all a comfortable bridge deck clearance of 80 cm. The same goes for the polyester sandwich and the moldings which stiffen the structure, the aluminum extrusion retained for the mast, and the 40 hp motors - at a time 10 years ago when most builders were content to use 30 hp. In fact, the 44 skips along at eight knots without pushing the throttles all the way - cruising speed is reached at 2,200 RPM.